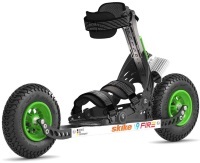 Skike have always been at the forefront of innovation when it comes to multi terrain roller skiing. Their skis allow you to explore terrain that is 'off limits' to regular roller skis, and provide you with a very good workout. The new family of Skike V9 and R9 roller skis is designed for roller skiing on a variety of different terrain, from tarmac to hard packed dirt and gravel. They can also cope with grassy terrain, as long as the ground is fairly firm and the grass is short. All V9 models are used with regular shoes, which are strapped in, and come with one-way ratchet wheels fitted as standard. These allow you to do both classic and skating technique. The Skike R9 Wahia is used with cross-country ski boots, and is designed for skating technique. The V9's come with a choice of two different wheel sizes: 150mm wheels are slightly smaller and lighter, and give a slightly smoother ride; while larger 200mm wheels allow you to tackle rougher terrain. V9's also come in the simpler 'Fire' version, and the 'Tour' version with more heel articulation for better 'classic' skiing. The Skike R9 Wahia is for skating roller skiing, used with cross-country ski boots. They work best with skating cross-country ski or roller ski boots, but also work pretty well with Salomon Pro Combi boots. We supply them with 150mm wheels as standard. These can be ordered with or without bindings fitted. All Skikes come with a standard manufacturer's warranty, and a selection of spare parts are available. 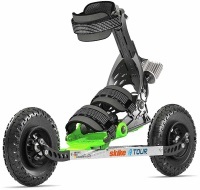 Skike V9 rollerskis are available individually, or as 'packages' including poles. 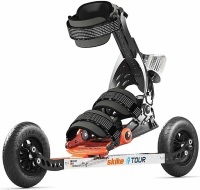 Skike R9 Wahia roller ski packages include bindings, boots and poles. We now have the Skike V9 and R9 roller skis in stock. You can order the Skikes here, or as a package here. See also the new Skike V7 Plus Pro here.